Larger, curved immersive displays are becoming the primary interface in the vehicle. Visteon will introduce several displays to the China market, inluding an eye-catching 3D cluster with a switchable lens delivering a 12.3-inch automotive-grade display with precise eye position tracking. 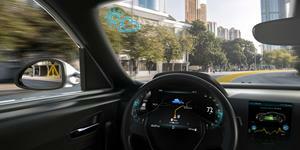 Visteon also will showcase its eXperience display – first shown at CES™ 2019 in January – which encompasses haptic feedback, proximity sensing and handwriting recognition.